Pamela Proctor was born in Regina, Saskatchewan, Canada, and graduated from the Faculty of Education at the University of British Columbia (UBC). 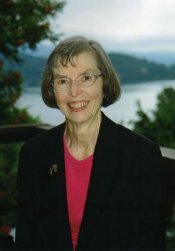 She taught in the Vancouver Public School System for 35 years. Although trained in traditional methods, she reshaped her teaching practice after experience and further study in England and at UBC. With like minded colleagues she started a program of team teaching and active child-centred learning at a new school called Charles Dickens Annex. While her career was almost entirely in teaching, she also served as a project teacher in an inner-city school and as an administrator. Her interest in photography led her to study with Freeman Patterson, enabling her to produce many of the images in this book. While teaching, her writing was published in professional journals, and she was interviewed by Chatelaine and CBC Television. After retirement she edited her father's manuscript I Was There, which was successfully published in 2000. 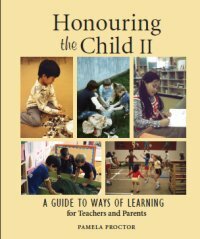 While the research and writing for Honouring the Child was performed over 25 years, she was determined to bring her work to completion. With encouragement from her mentors, including Lilian Katz and Sylvia Chard, she completed her book which became available in the fall of 2007. She then embarked on an extensive program of speaking tours throughout British Columbia, meeting with parents and teachers in over 30 communities, and visiting the centres of teacher education. In 2012 she was invited to support the start up of a Reggio Emilia inspired program. Through this process she became aware of a need for practical information to facilitate ways of learning for young children. She spent most of 2012 in research and writing for her second book, Honouring the Child II: A Guide to Ways of Learning for Teachers and Parents, which is now available. She resides in Gibsons on the Sunshine Coast north west of Vancouver, British Columbia, Canada. In addition to her writing, she leads a community fitness program and enjoys cruising with her sailing instructor husband.